Monochrome Author is a free widgetized theme for WordPress packaged with an author archives page, AJAX slideshow, posts with thumbnail and pullquote custom fields options and a CSS framework to aid in customization. GETTING STARTED: By default, the slideshow in Monochrome Author displays the most recent posts, followed by the excerpts of the previous five entries, offset by two. The number of posts displayed in the slideshow can be controlled via your WP admin panel by clicking Options > Reading. 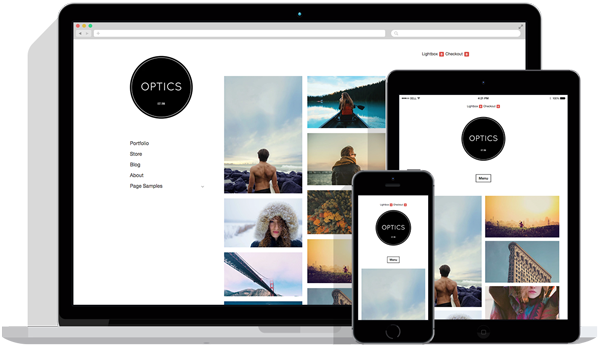 PHOTOS, PULLQUOTES, CUSTOM FIELDS: This theme uses custom fields to manage all photos and thumbnail photos. In your WordPress settings, you can change the dimensions on both thumbnail and medium sized photos. Change the thumbnail width to 128 px wide by 128px tall. Change the medium photo size to 575 px wide. Save the settings. WordPress will resize every photo uploaded to the dimensions described above. After uploading the photo into WordPress using the media uploader, copy the link to this thumbnail photo and paste it into the custom field value, with a key called “thumbnail.” Copy the link to the medium photo (575 pixels wide maximum) and paste it into the custom field value, with a key called “photo.” Here is a screenshot of all properly filled out fields. 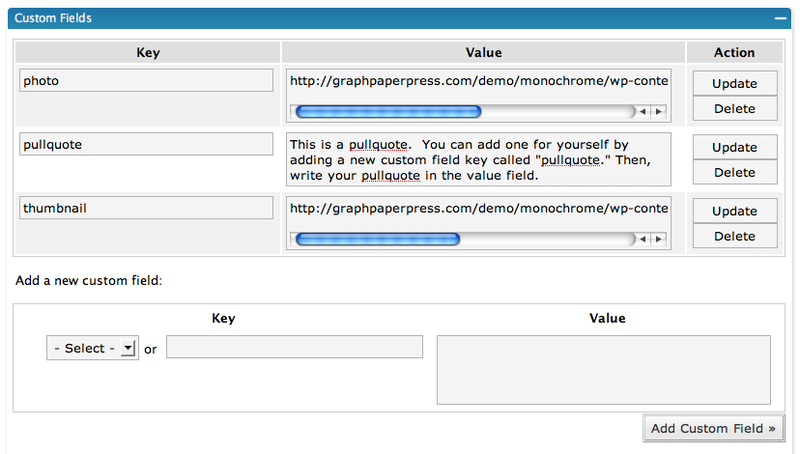 If you want pullquotes, then simply create a key called “pullquote” and type your pullquote into the custom field value. Here is a screenshot of all three properly filled out fields. YOUR AUTHORS PAGE: Monochrome Author comes packaged with an author archive (authors.php), which will display some author specific info pulled from the Users page in your WordPress installation. In order for the author’s image to show up, you’ll need to place a jpg of the author titled by the author’s last name in the wp-content/themes/monochrome_author/images/authors/ folder. For instance, mine is Allender.jpg, sized at 75px X 75px. Here is an example author page. STYLES.CSS: Unlike most WordPress themes which plug all the css in one file called styles.css, Monochrome utilizes the Blueprint CSS framework to help separate positioning, typography, forms and what I’ll refer to as custom or Monochrome specific styles. To edit all custom Monochrome specific styles, you’ll need to edit the file style.css in your wp/wp-content/themes/monochrome/ directory. This theme utilizes a CSS framework called Blueprint. Who is credited for the ideas behind Blueprint? Some of the best designers on the web. They include Jeff Croft, designer for Blue Flavor, Khoi Vinh, design director for NYTimes.com, Nathan Borror, Christian Metts, Eric Meyer, Wilson Minor, Angus Turnbull, Olav Bjorkoy and a few others. Most major websites use some form of css framework to allow for rapid, consistent development and design. Take the Blueprint 101 course to learn about all the possibilities. I have been toying with wordpress and this theme and noticed an error on the page which seems to be persisent on just about all the sites using different themes you offer. The error is even on your page. Is there a way to get rid of it. Also the lite version just bombs in 2.5.1. Sorry for so many negatives but I thought your themes are great and wanted to offer my feed back. I don’t understand a thing.. What is ‘custom fields’? And another thing: How do I enable the slideshow or whatever the black box is on the frontpage? Just wanted to thank you for standing by the cancellation policy. After subscribing, I realized that the theme didn’t meet my needs after all. Graph Paper Press promptly processed my cancellation – just like they advertise. I really appreciate that.